Guess What's In Ben & Jerry's New NYC Flavor? Cheesecake. Pizza. Clam Chowder. New York has inspired plenty of iconic edibles — and now, there might be another one to add to the roster: ice cream. 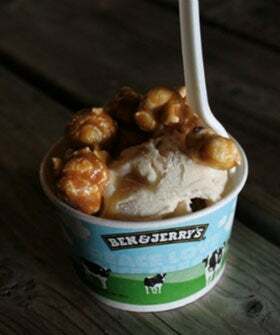 On Friday, Ben & Jerry's presented the New York Borough Brew flavor at a one-time-only tasting event on Pier 57. As part of the brand's "City Churned" campaign, Ben & Jerry's allowed New Yorkers to vote on their favorite ingredients to create the flavor.